Which is the best way to learn the lessons of life? There are two ways to learn the essentials of life. The first is by going through the process of structured training and education. The second is about learning hands on, making mistakes and then understanding the dynamics and processes of the subject. While the second path is called learning through experience, it can be time consuming and is prone to mistakes, which when made, can prove to be costly ones. Take the example of financial planning , every individual would like to live a happy and contended life, making all the right financial moves at the right time thereby getting maximum satisfaction and enjoying a well balanced life. If financial planning is done in an unstructured manner,it is more likely to result in disorder leading to eventual stress and dissatisfaction. Contrary to this, if an expert in the field of financial planning is entrusted with the job of financial planning, it can work wonders as the financial planner can provide the right financial plan which is perfectly tailored for the individual. Yes, like education and training, financial planners too come at a cost. However the benefits of financial planning which accrue far outweigh the costs. The ultimate goal of a blissful and contented life can be achieved thus, with ease. Here are five likely mistakes which can be prevented by taking the help of professional financial planners. Inflation is as much a part of life as anything else. Estimation of expenses or income, to be spent or to accrue in future, is bound to be affected by inflation. Income will get devalued while the amount of money needed today to make a particular purchase will be inadequate a few years later. You may have to spend on your kid’s primary school education, an amount equivalent to which your father spent for your college education. You may be spending on a family eat out, an amount equivalent to which your father spent as provision expenses for the entire family. It is therefore important to provide for inflation, while drawing up a financial plan. When the element of inflation is ignored, it will eat into the savings and leave little surplus for future goals. It is thus necessary for individuals to incorporate a reasonable rate of inflation while drawing up financial estimates. When food is cooked it is essential to know the ingredients, the spices and the number of people for whom the dish or dishes are being cooked. Similarly in case of financial plans too, it is essential for people to know exactly what they need to fulfil and the tools necessary for achieving the same. Education of children, marriage, purchase of assets like house and car, travel and retirement are some of the avenues of expense which if not planned properly can leave a huge dent in savings and at the same time contribute towards all financial plans going awry. To get clarity on any financial goals, pay attention to 3 aspects of the goal. Quantitative aspects, qualitative aspects and when to achieve. Quantitative aspects may be like how many square feet, how many rooms, how many floors, how far from your work place and schools. Qualitative parameters may be like, prime location or suburb, flat or independent house, what class of construction. When to achieve doesn’t need an explanation. 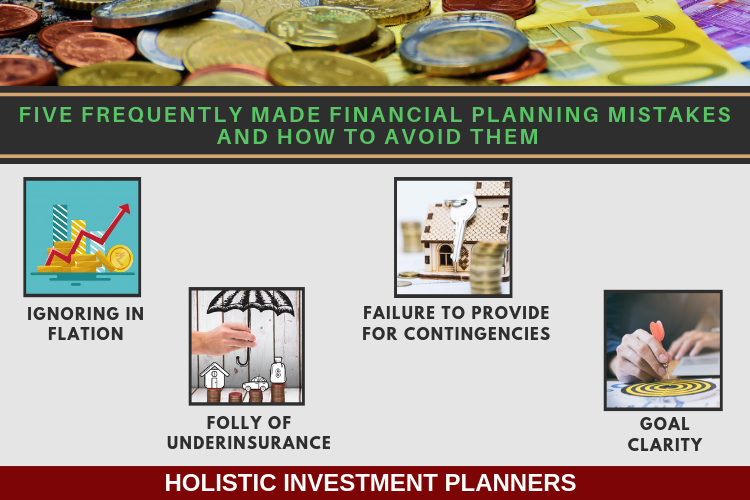 Professional planners are experts in this field and hence can contribute positively towards the individual investor’s quest to attain financial bliss. It is a desire that our lives will be like a bed of roses with no obstacles and hindrances. However, seldom does life unfold in that manner. Unexpected events can cause setbacks. A sudden fire or earthquake can destroy property, illness to a near and dear family member may set us back emotionally and financially and similar such instances can affect the implementation of financial plans in a big way. Having an alternate plan in such situations is important. Maintaining liquid assets, like cash in liquid funds is an important “plan B” proposition. This fund should be judiciously maintained and not spent on frivolous expenses. It is always advisable to maintain a good insurance coverage for tiding over situations like loss of income of a deceased individual, or any other insured event. The loss of an earning family member can be emotionally painful and has to be coped at a personal level, however the loss of earning can be taken care of by having an adequate insurance cover in place. This will ensure that the family does not face financial hardships due to the sudden loss of income. Financial planners are best equipped to make a judicious judgement about the insurance cover necessary after considering all aspects like debt, income and other liabilities. Financial planning is all about the future. The future which is uncertain and hence one needs to plan based on certain suppositions and assumptions. Professional financial planners know how important it is to keep the assumptions realistic. An utopian or unrealistic assumptions about various parameters like expected returns on assets, life expectancy, interest and borrowing rates, inflation, etc. can lead to unrealistic planning. This will in turn result is miscalculations which can have significant negative implications. To have a right and bright financial future, learn from the financial mistakes of others, and avoid being one whose financial mistakes are used as financial lessons by others. To get this financial stability and security, to understand our unique Holistic Financial Planning Process we offer a 30 minutes free consultation. Previous Previous post: Why your annual bonus or lump sum arrear is not increasing your net worth? Next Next post: Can Low Cost Providers Offer the Best Financial Planning Services?